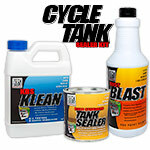 The Large Cycle Tank Sealer Kit contains everything you need to seal a tank of up to 12 gallons. 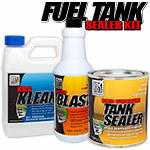 Gold Standard Fuel Tank Sealer, from the makers of KBS Coatings, is a superior, single-component, ready-to-use fuel tank sealer. 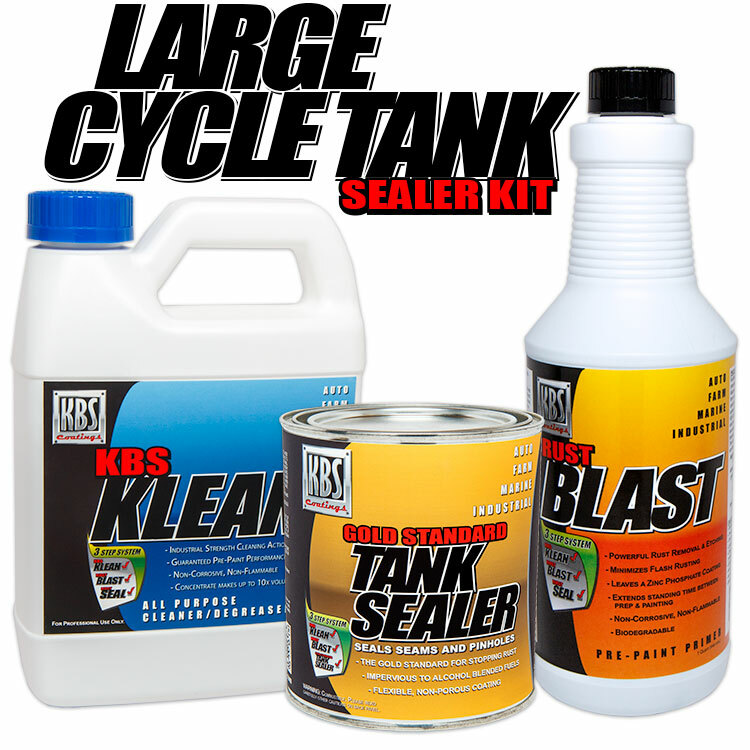 This kit contains our KBS Klean (a water-based, heavy-duty, cleaner/degreaser) and KBS RustBlast (a powerful rust remover/metal etch) to obtain a permanently sealed, rust-free fuel tank. These KBS prep products are formulated with a unique Oxygen-Block Technology which reduces the occurrence of flash rust by over 80% and extends rust-free storage times by leaving a temporary protective coating in addition to a zinc phosphate film. Our PLUS KIT contains a Quart of Strip to quickly remove failed sealers. Go HERE for the PLUS KIT. Used large cycle KBS to seal up some pin holes in the welds on a new aluminum fuel tank and pressure tested it to 15psi. No more leaks. Worked great. Product works as claimed when instructions are followed. Biodegradable is a great attribute. used product on diesel heater. followed easy directions and worked great. tank as good as new. I used this kit 6 years ago in my gas tank and its still perfect!!! Used this product to coat an aluminum fuel tank for methanol which customer inadvertantly purchased instead of stainless steel.Product was easy to use and has shown no signs of breaking down in the methanol. Wow, what a great product. I had a Goldwing that sat for two year and the tank was full of old gas and rust. The Klean removed most of the old gas when I put some nuts and bolts in there to swish around. The rust remover worked great and the tank looked almost new when that step was done. The sealer needs to be done right. If you put in more than needed you need to take time to keep getting it out of the tank when it pools. If you take your time you will be extremely satisfied. Give it 5-6 days to cure fully. 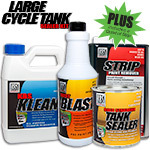 This is probably the best product on the market for tank restoration. Product was exactly what I was looking for. There was enough product to do a 6 gal. motorcycle fuel tank, no problem. Easy to work with and it looks like it will do the trick. Used the tank sealer kit on two Honda 3 wheelers that had been sitting in a barn for several years. 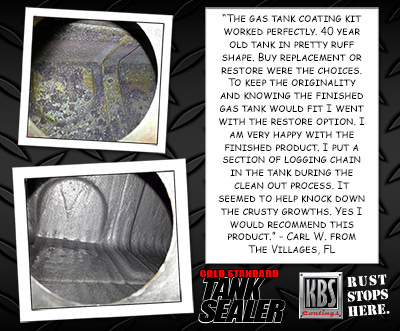 Rust buildup in gas tanks was significant. I modified the process slightly as I wasn't sure if the rust remover would get all the rust out. After the cleaner, I soaked the tanks with apple cider vinegar for a week to break loose the majority of the rust. Was left with a little bit of rust and some flash rust when I used the Rust remover. It cleaned out the remainder and left me with a clean tank to use the sealer. One of my tanks had a baffle at the gas cap and it was a real pain getting the excess sealer out of the tank. I finally just tipped it on the side and used a paper towel to soak up as much as I could. Then turned the tank some more to spread out the rest and it worked ok. So far, the tank sealer seems to be holding up well. I'll never know how long it will last as I plan to sell the trikes. Prep time for this takes a while. Be patient and prep the tank properly and you will get great results! Q: Can this product be used in diesel fuel tank? A: Yes, the Gold Standard Tank Sealer is completely impervious to diesel fuel and is used in diesel fuel tanks all of the time. Q: What is the "mesh" (that is an option on the order form) used for? A: You can use the piece of BackBone Reinforcing Mesh for exterior repair of pinholes or weld seams. Prior to patching, prep the outside and inside of the tank by using KBS Klean and RustBlast and allow all surfaces to dry completely. Begin by sealing the inside of the tank as outlined above. After sealing, immediately use any remaining Sealer to paint a thin layer on the exterior pinhole area(s). Using a suitably sized piece of BackBone Mesh, embed it directly into the wet Sealer and apply another thin coat of Sealer painting outward from the center. Let cure.